An open letter to the RedBull Foxhunt: why we should be encouraging all women to ride mountain bikes, not just the under 25s. The event has, I think, sold out and its laudable that Redbull is supporting one of the most high profile mass participation events in women’s mountain biking. It’s great that they want more young women to take part too. But you only have to look around a trail centre car park to realise that mountain biking isn’t exactly awash with women of any age, and a ticketing strategy that favours some women over others is hardly fostering inclusivity in the sport. I’d also point out that turning 25 doesn’t mean you win the lottery. I’m sorry to break this to the youthful organisers at the Redbull Foxhunt office, but you can be skint at any age. Like many others, I would love to see cycling become a viable and enjoyable option for all women. A few weeks ago I organised a talk at Look Mum No Hands called Letting Ourselves Go – the aim was to celebrate older women who ride. The idea came about because of my work as cycling journalist. Over and over again, I find that it is older women who have all the best stories to tell, from pro rider and Hour record breaker Bridie O Donnell (a record she smashed aged 41), to amateur riders including Roz Harper (aged 63) who rides Enduro having survived cancer and a double knee replacement, and Diana Montgomery (aged 64), a grandmother who represented GB in the UCI Gran Fondo Worlds and matched the time of her 25 year old team mate. Its jaw dropping stuff, and a lifetime away from stereotypical ageism about taking it easy, National Trust tea rooms and aerobics in the village hall. But while women are now enjoying a higher profile in cycling, older women who ride still largely remain invisible. To be fair, I don’t think many of us are secretly yearning to appear on the cover of Cycling Weekly – but it was great to be able to get together and acknowledge that, when it comes to cycling, older women are pretty bloody good at it – and that age is no barrier to participation. It was a fantastically well supported event, and the room was packed with older women who love riding bikes. I was joined on the panel by Alex Feechan from FINDRA, Julie Rand from Cycling UK and Belinda Scott of SW London women’s cycling club Bellavelo CC so we had a well-informed debate, but the best part of public speaking is always the ‘any questions?’ session with the audience: no matter how much research I do ahead of the event, sharing in the audiences experience is always an opportunity to learn and this evening was no exception. The discussion ranged from the need for a wider range of age categories at races to why its important to encourage all women, whatever their age, to ride. And there we have it. Women need many and varied role models in mountain biking – from Rachel Atherton to the riders who turn up at trail centres on a Sunday morning, we need to see women of all ages, levels of experience and ability on bikes. It’s okay to be slow or fast, to be brave, to pootle around, to ride in groups, to ride alone, to favour cross-country or DH, to be old or young. We need to encourage everyone to take part, across the board. We need to let everyone know they are welcome and equally – and not hit some of us with a bigger bill because we happen to be over 25. FEAR, MTB & WHY YOU’RE ALL AWESOME! The response to my post on mountain biking and fear has been awesome. I loved reading your comments which are full of honesty, courage and wisdom. Here are some of the absolute gems – I hope they will inspire you to face your mtb fears. I thought long and hard before I wrote my post about Fear and Mountain Biking – firstly because mtb is full of posts where people are getting air and having the time of their lives and I didn’t want to put a downer on that, and secondly because I’m wary of admitting stuff like this on SM, where we’re all supposed to be sorted and ‘feeling blessed’. But I did it – and whatdoyaknow – it’s been one of the most popular posts I’ve ever written. At the end of the post I asked how you deal with fear, and your responses have been so brilliant I thought it might be a good idea to share some of them here. There is so much that is useful – thanks to everyone for taking the time to share your experiences (and sorry I can’t share them all but we’d be here all night!). And now over to you guys…. “Part of the reason I stopped riding was fear and feelings of inadequacy. My last ride was marred with someone tutting so much and then nearly took me off because I was riding so slowly then hit my rear wheel which says more about them than about me. I’ve always been cautious…but the attitude of speed or you’re crap really spoiled it”. From the Cotic Bikes Facebook page, who kindly shared the post. “I really welcomed this post, as I think fear is something we don’t talk about much in relation to every day riding, but it’s something I have to work really hard at to control. I regularly feel a slight catch of fear of simple trail features, such as a muddy puddle or off camber root, as I don’t like the bike moving unpredicatably. I’m aiming to race a World Cup next year so I need to push myself on features that quite frankly, I’d rather not do at all! I’ll talk to my man about my worries, such as not having control, or not making the corner. I’ll also critically look at the feature, and if it’s far beyond my skills or limit, I’ll walk away but will write it on my ‘to conquer’ list. It’s a nice reminder to keep pushing the limit and to go back in a few months. I’ll also seek out similar but smaller features to train on first and practise my body movement. “There’s a technique known as ‘graduated exposure’ which works brilliantly; it’s about gradually acclimatising yourself to a particular situation (slippery descents for example) but the really awesome thing about it is that you also have to reward yourself each time you tackle something that you’re afraid of. I’ve had the excuse to buy myself some great bike kit as a result! Vote for your favourite sportswoman of the year with Glamour, and help support the fight against sexism in sport. 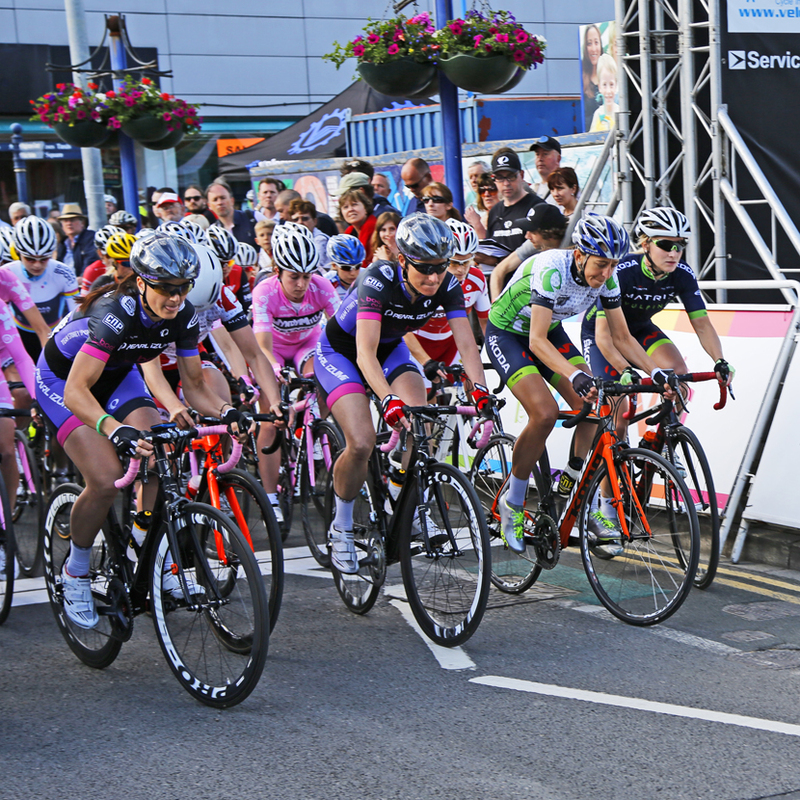 Dame Sarah Storey (centre) crosses the start line on the Tour Series. With the annual back slapping fest that is BBC Sports Personality of the Year looming, it is worth reminding ourselves that for the last eight years the winner has been male – and only 13 winners in its 61 year history have been women. With this in mind, Glamour magazine – one of the UK’s most high profile women’s titles – has drawn up its own visionary shortlist featuring female athletes who have, to quote ‘smashed it this year’. All we have to do is vote for our favourite (or favourites!). Not surprisingly, I’ve voted for Sarah Storey and Lizzie Armistead – but I hope the list also opens up discussion: personally I wish Rachel Atherton – World Champion Downhill Mountainbiker – had also been included because she is right at the top of her game, wins everything she looks at, and is a superb ambassador for the sport. Unfortunately, and as far as I am aware, there will be no swanky awards ceremony to announce the winners – a pity, as Glamour throws a very good party if the Glamour Women of the Year awards http://www.glamourmagazine.co.uk/fashion/celebrity-fashion/2015/06/glamour-awards-dresses-red-carpet-2015-photos-glamour-uk are anything to go by. But who knows for next year (and if it happens, can I have a ticket please?)? Finally can I just add that it is great to see such a high profile title as Glamour supporting women’s sport in this way, as part of their ‘Say No To Sexism in Sport’ campaign. It is no secret that, in order to attract the big budget sponsors necessary to support our athletes and help encourage more women to take up sport, we need mainstream media to highlight the inspiring stories and incredible achievments that make women’s sport so special. Kudos to Glamour for leading the way. Follow the campaign at @GlamourMagSport. Everyone has their trail nemesis. I’ve decided to name and shame mine in a vain attempt to be less intimidated by them. So here goes… number 1. TEN YEARS. That’s how long I have been trying to ride a bike over this uphill root step. 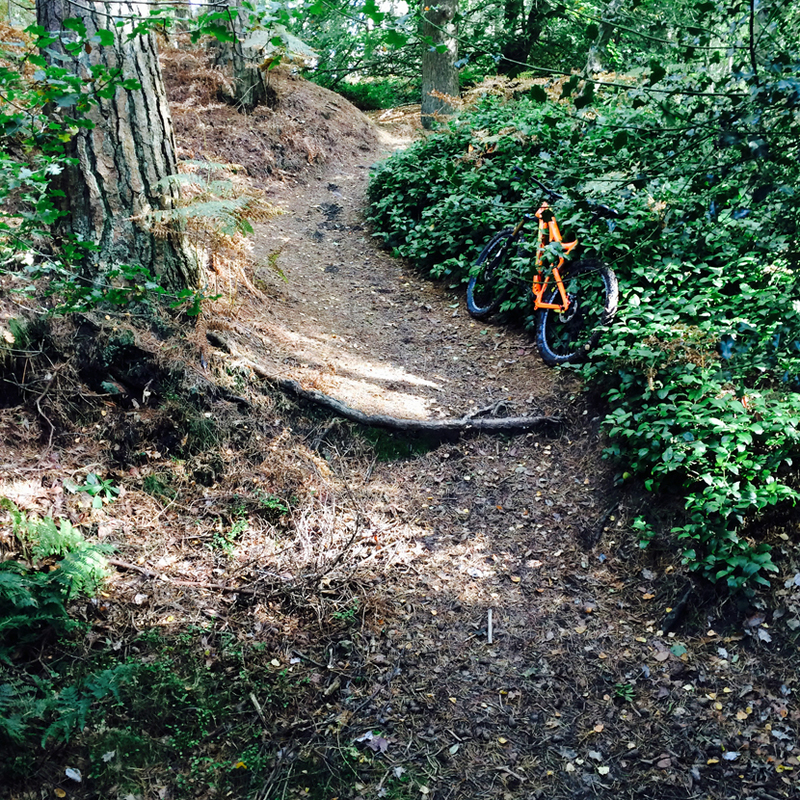 26″, 29er, 650b, full sus, locked out sus – makes no odds – I just can’t manage it. ‘Just lift the front wheel over!’ advise blokes with arms the size of hams, as they look on in bewilderment as yet again my front wheel comes to a grinding halt against it or I topple off into the adjacent bush. Unfortunately just riding round isn’t an option as its actually a detour around an extremely sticky puddle. To be fair to me, the run up to the slope is short, overhung by branches, and rooty so its difficult to get any speed up. The slope is steeper than it looks, and the root seems to suddenly grow six inches as you approach it. But still it seems to exist to let me know that I have reached my limit in technical riding or at least – crucially – that’s what my head believes. I once spent half an hour trying to tackle it with a really experienced technical rider to help me. “Just lift the front wheel over the root, put your weight forward so the back wheel can hop over it and then pedal hard’ he said. Embarrassingly – but not surprisingly given the above information – I still failed. In my own defence, I’m not usually beaten by a trail. Ten minutes later and further down the trail I popped over another root without giving it a second thought (at which point my expert friend looked at me with utter bemusement and said “That was so much more technical”). Go figure. Is it really just a case of lack of a combination of a good run up and brute strength? According to Rachel Atherton in Singletrack magazine: ‘Remember, men are naturally stronger and heavier, so you’re probably a better rider”. Wise words, but they’re still not getting me over that root. I’m nominated in the Singletrack 2015 reader awards! I am stunned and excited to have been nominated in the Singletrack 2015 Reader Awards, in the Best Written Article category. I’ve been shortlisted for my post ‘The trouble with womens’ mountain bikes’, which was originally published on the Singletrackworld.com site earlier this summer. Singletrack had approached me about writing for them after I published a story on this site celebrating their choice of a female rider for the magazine cover – a hugely popular story that even Rachel Atherton retweeted! For the nominated post on women’s mountain bikes I went back to the drawing board and spent a lot of time checking facts and researching details from brands such as Santa Cruz, Trek, Specialized and Orange, as well as talking to female cyclists and local bike stores. The result – I hope – peels back the layers of marketing and gets to the bottom of why it can be so difficult for women to find the right bike. It also addresses the fact that there is actually no such thing as a ‘men’s’ bike: perhaps it is time to start using the term standard bike instead, make more sizes and fit options, and also show women riding them alongside men in advertising. There are several categories to vote for, but I believe Manon Carpenter (nominated for personality of the year) and I are the only women up for a prize. So lets hope at least one of us gets to make a victory speech and fly the flag for women’s mountain biking at the awards ceremony on the 25th September!! Voting closes at midnight on Sunday 20th September and (hint, hint) you can vote here or on the link to the post above. Hurrah! Singletrack magazine have put a woman on the cover!! Mountain bike magazine Singletrack put a woman on its May 2015 cover, and it’s caused a bit of a stir. The cover of Singletrack May 2015 featuring Laura Brethauer. Image by Christoph Laue. 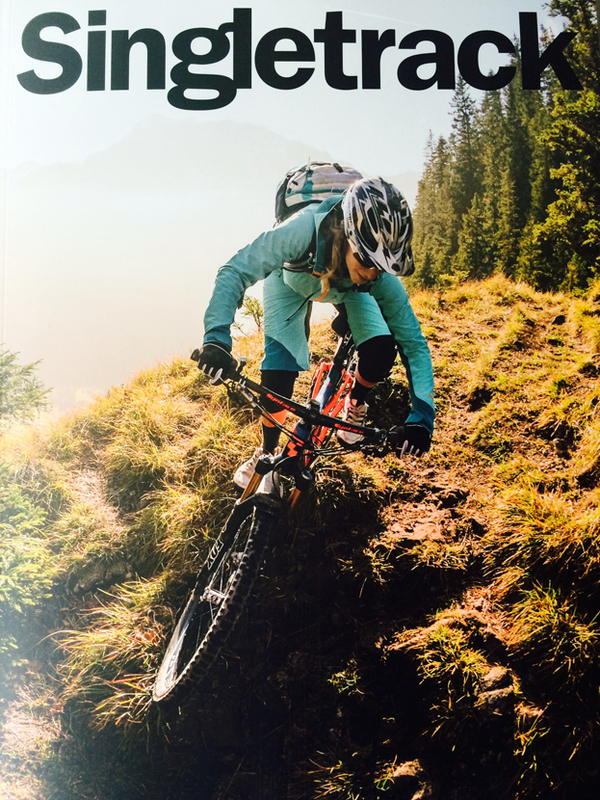 Singletrack magazine is always a good read but I am really pleased to see a woman on the cover of their May 2015 issue (German Enduro rider Laura Brethauer, about to go over the edge of something very steep). To be honest I am also a little surprised as women in mountain bike magazines tend to be noticeable for their absence. I tweeted about the cover on Saturday and got a huge response – all positive – including a RT from Rachel Atherton (19 mountain bike world cup wins to her name, and a major player in promoting women’s mountain biking) who added ‘Was buzzing when I saw this!! Respect!!’. I love the image (by Christoph Laue), because its not posed: Brethauer is clearly totally engaged in her ride. It’s the moment we all ride bikes for and it isn’t about being male or female. Singletrack tell me that they chose it simply because it deserved to be a cover, and not because it’s a picture of a woman. This is, of course, as it should be. However it is also really heartening to see a woman represented on the front of this esteemed (and little bit maverick) mountain bike title. As a print journalist it is also good to see that magazine covers continue to command respect: everyone who saw this and commented on it understands that putting a woman on the front is way more significant than slotting one in somewhere in the vicinity of page 36. I’m aware that most mountain bikers are male (80%, I think) and that magazine making is a business, and that it is dependent upon entertaining its target readership. I also know that the vast majority of mountain bike photography features men. And of course, I don’t want to see a quota of ‘women covers’ to win a few PC points. But let’s hope that the reaction that this cover has generated may just inspire photographers to work with women riders, and editors to continue to take the occasional risk with their choice of cover star.